The (IGN) National Geographic Institute was established on September 12, 1870, with the following task description: determining the shape and dimensions of the Earth, geodesic triangulations of various levels, precision leveling, topographic triangulation and topographic and cadastral surveying. 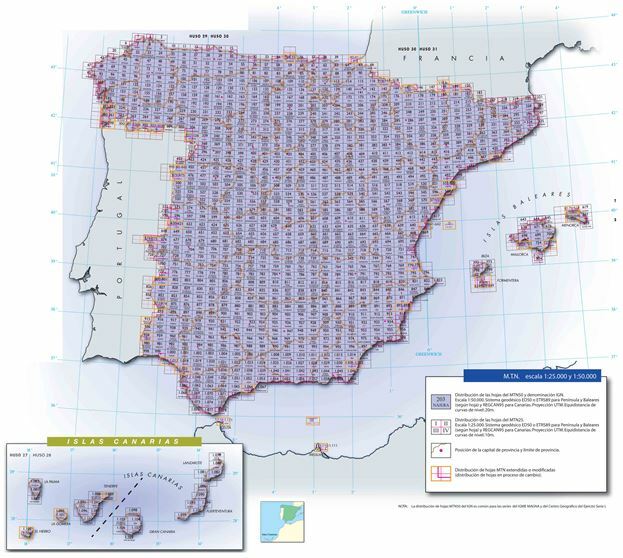 The CNIG collects, manages and distributes the geographical data of Spain. They publish topographic and thematic maps. 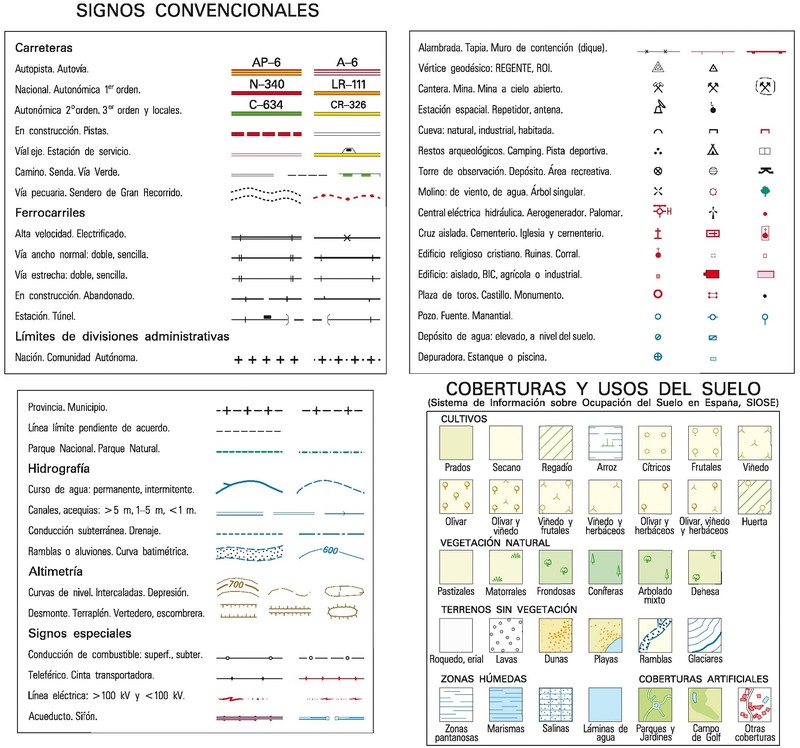 The MTN25 series (Topographic map of Spain 1:25.000) is a main part of the Basic State Cartography. It's composed of 4123 sheets (dimensions are 5' latitude 10' longitude) derived from the MTN50 distribution scheme. Each MTN50 sheet is divided in four quarters, obtaining 4 MTN25 sheets from each MTN50, identifying them with roman numerals (-I, -II, -III, -IV). 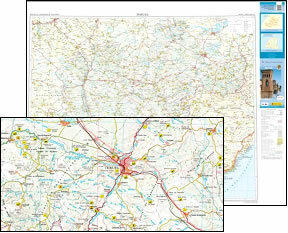 The MTN50 series (Topographic map of Spain 1:50.000) is a main part of the Basic State Cartography. It's composed of 1106 sheets. The first edition was finished in 1968, coinciding with the start of the production of the new MTN50 series that ended being the Basic series of the official cartography in Spain. 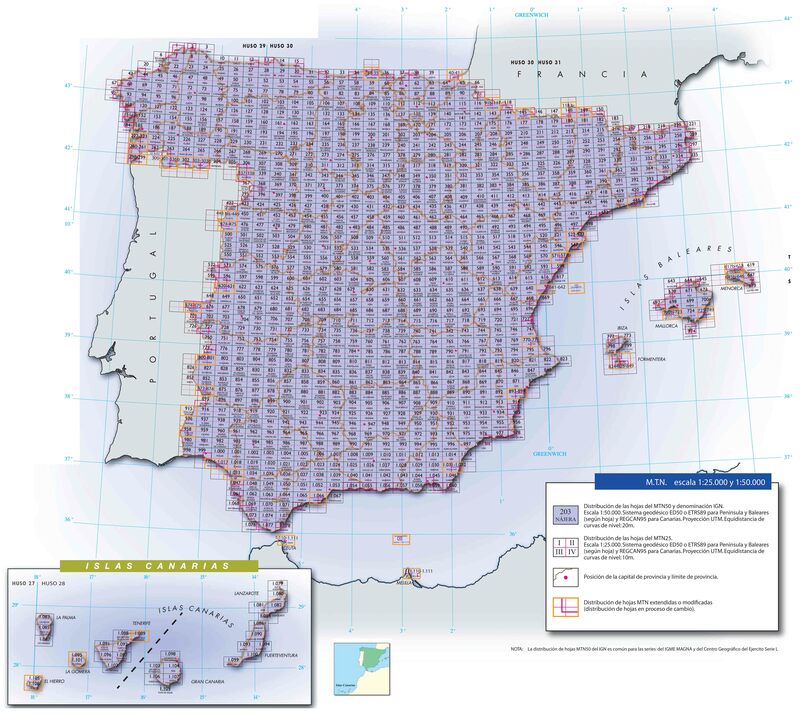 The provincial series consists of 48 maps (the 3 Basque Provinces are published all together) in scale 1:200.000. It's the higher resolution and most detailed cartography of the derived cartography series. 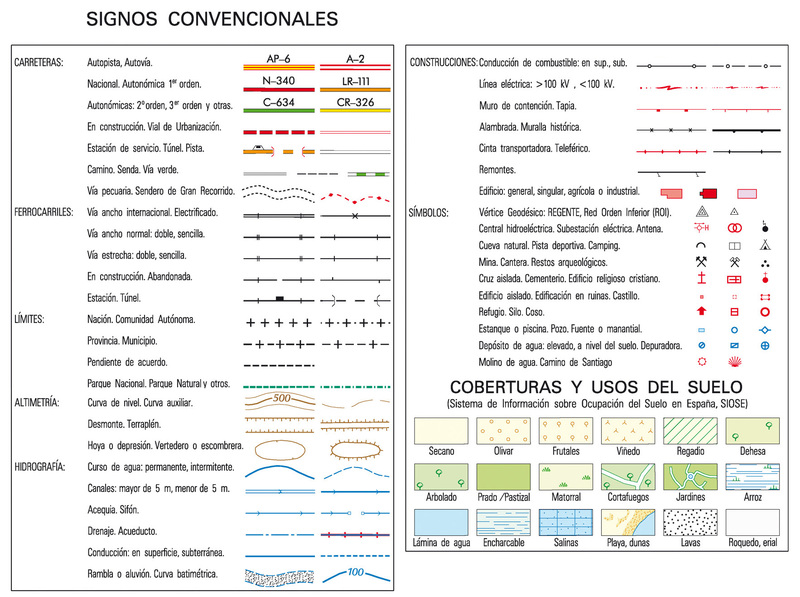 The provincial based Spanish territorial division is a good base for designing an intermediated scaled cartography that joins a correct edition format with an enough detailed scale. 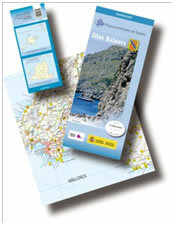 Is composed by those maps which unit is an Autonomous Region. The cartography base is the provincial map. Is produced in different scales, from 1:200.000 to 1:400.000, depending on the geographic extension of each Autonomous Region. 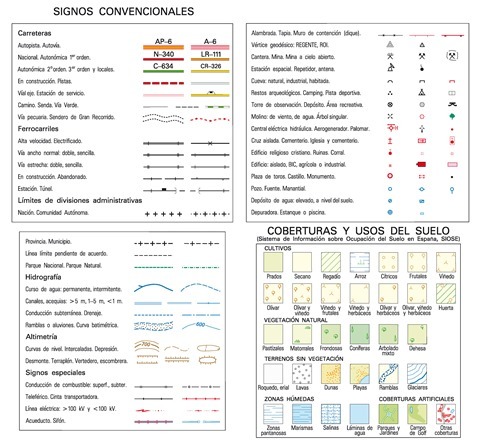 The National Geographic Institute of Spain has published a collection of cartographic products of the Way of St. James and its more popular paths, The French Way. These products are compatible with GPS devices and contain thematic information very useful for the travelers. 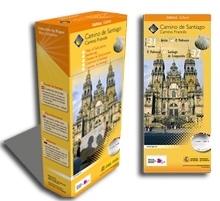 For each stage, next to the main route and its variants at scale 1: 50,000, information about monuments and services (lodging, accommodations, shops, restaurants, etc.) is provided from the towns on the route. To help planning the day, schemes of each stage are incorporated in which the distances between the towns are indicated and vertical terrain profiles are presented. 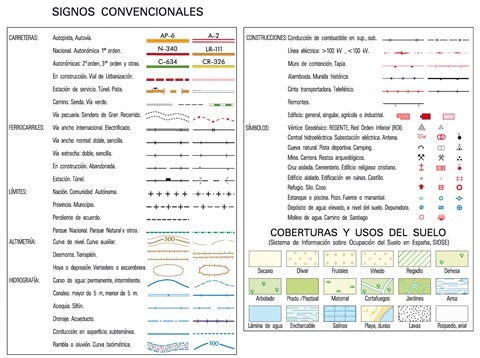 The National Center of Geographic Information (CNIG) in collaboration with the Autonomous Organization National Parks of Spain, depending of the Ministry of Agriculture, food and Natural Environment is producing and distributing guide maps of the National Parks of Spain. Maps of special interest regions such as Natural Parks, mountain chains, islands, etc.